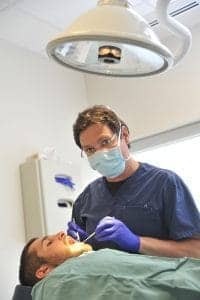 Sedation dentistry is often referred to as a service that is only for patients with dental anxiety. While this can be true, some just prefer not to be awake during a procedure. At East Coast Oral Surgery, we make sure to offer the safest/most comfortable environment for our patients. For this reason, we offer local anaesthesia and IV Sedation at our clinic. For major cases administered at the Moncton City hospital were Dr. Daniel and Dr. St-Germain have special privileges, general anaesthesia can be offered. An anaesthesiologist will administer the anaesthesia during these procedures. What are the differences between Local Anaesthesia, IV Sedation and General Anaesthesia? Local anaesthesia: The patient remains conscious throughout the procedure. A local anesthetic is administered in the area that the surgery will be performed. IV sedation: Medications are administered through an intravenous line. The patient will fall asleep and be completely unaware of his surrounding. Patients usually choose this option if they have high levels of anxiety. General Anaesthesia: The patient is taken to the hospital where anaesthesia will be administered by an anaesthesiologist. This is used for extensive procedures such as face and jaw reconstruction. For more info about this service, call us today!